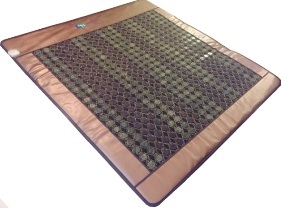 Experience the relief and relaxation from this king-size or queen size health mat with Far-Infrared rays and relaxing heat. It is big enough for two people to use simultaneously and has separate heating controls for each side. This mat is made of mesh inlaid with 2” pieces of jade and tourmaline. These two rare and unique materials offer many health and wellness benefits. Tourmaline is in the silicate family of minerals and is a very powerful and rare material. It offers many health benefits and offers a unique way for the user to relax and get relief from various physical and psychological ailments. The following is a list of benefits of tourmaline. Jade is one of the most heat absorbent of all the semiprecious stones. When other mediums of heat are passed through it, Far-Infrared rays are emitted. The following is a list of some of the benefits of jade. With the combination of tourmaline and jade, the InfraMat KingMat emits healing Far-Infrared rays to help the body heal. With jade being such a great conductor of heat, it allows for maximum benefits when combined with tourmaline. Far-Infrared rays are naturally found in such places as springs, waterfalls, beaches, and mountains. 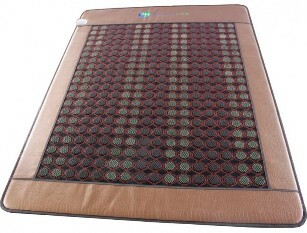 This heating mat is a natural and convenient way to get these health-boosting ions in the comfort of your home. The negative ions produced by the mat help the body maintain a healthy immune system and renew calcium and sodium in the bloodstream. The therapy from the InfraMat can help the body burn up to 900 calories in 1 hour. These rays aid in maintaining a healthy body weight and overall sense of well-being. The infrared rays also help with expelling toxic chemicals, such as carcinogens, heavy metals, and poisons, from the body. The heat can be adjusted differently for each side of the mat and is controlled by a simple LED display. Are you suffering from stress, anxiety, or depression? Perhaps your body is worn down by the toxins in the environment and you need relief. The InfraMat KingMat with jade and tourmaline can help you with these issues and so much more. This mat can offer relief to your tired mind and body. The benefits of these materials are amazing and can help the user feel healthy, vibrant, and youthful again. If you could benefit from a renewed energy and relaxation of your body and mind, the InfraMat Pro KingMat or QueenMat may be just the product you’ve been looking for. With its use of negative ions and Far-Infrared rays, the InfraMat KingMat or QueenMat can offer relief from many chronic and acute health problems.